♦ Invisible Cities, Italo Calvino, translated by William Weaver, Picador, 1979. ♦ Along the Briny Beach, J. R. Carpenter, link: luckysoap.com/alongthebrinybeach. ♦ The Practice of Everyday Life, Michel De Certeau, translated by Steven Rendall, University of California Press, 1988. ♦ How We Became Posthuman, Katherine N. Hayles, University of Chicago Press, 1999. 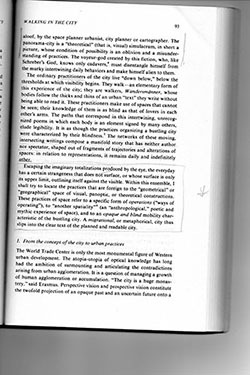 ♦ Species of Spaces and Other Pieces, Georges Perec, translated by John Sturrock, Penguin, 1999.